A leading scholar of modern Israel said the Jewish state’s future depends on the creation of a separate Palestinian homeland in the West Bank. “Every time Israel makes it harder to build a viable Palestinian state, we make Hezbollah and Hamas stronger,” said Peter Beinart, a professor at City University of New York. Beinart is also a columnist for the Israeli newspaper Haaretz and the author of three books, including The Crisis of Zionism. He spoke to a crowd of more than 400 at Congregation Beth Israel in La Jolla. The event was sponsored by the San Diego chapter of J Street, a liberal, pro-Israel organization that supports the creation of separate Palestinian state to achieve a lasting peace. Beinart said continued construction of Jewish settlements in the West Bank makes it increasingly harder to find a compromise, and threatens the foundation of Israeli democracy. This is because the Palestinians remain as an ethnic underclass within Israel. “Settlement growth threatens the core of the Zionist dream because it takes that destiny out of Jewish hands,” he said. He said Americans are often afraid to criticize Israel because until recently the country was weak and threatened by external enemies. Now it’s a regional superpower, he said, with the biggest threat being from within. What makes Israel unique, he said, is that it is a country founded to preserve the Jewish people after so many centuries of persecution. “I want Israel to remain that place,” he said. 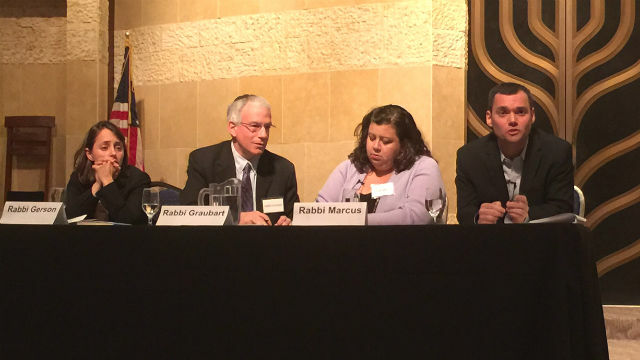 After Bienart’s speech, a panel of three San Diego rabbis led a discussion with Beinart and asked written questions submitted by the audience.